JBL OnBeat speaker dock takes an iPad, iPhone or iPod | What Hi-Fi? Given the success of Apple's iPad, it's hardly surprising we're seeing an increasing number of iPad speaker docks coming to market. 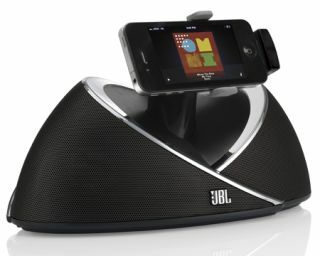 JBL is the latest to join the fray with its £150 OnBeat, which can accommodate an iPad, iPhone or iPod. Users can rotate their iDevice to view it in portrait or lanscape mode. A USB connection enables syncing with iTunes when connected to a computer, there's a 3.5mm jack for connecting non-Apple devices and an optional composite cable can be used to send video from your portable to a TV. Naturally you get full remote control, and there's a choice of black or white finishes.